On May 20th, Concerned Residents of Greater Prospect Lefferts Gardens hosted a public meeting in Grace Church chapel to address concerns about the neighborhood’s future. Front and center on the agenda was the 23-story glass apartment tower planned for 27-35A Lincoln Road. Speakers also pointed to skyrocketing rents, abusive landlords, and worries about our area’s vulnerability to the displacement that accompanies unchecked gentrification. 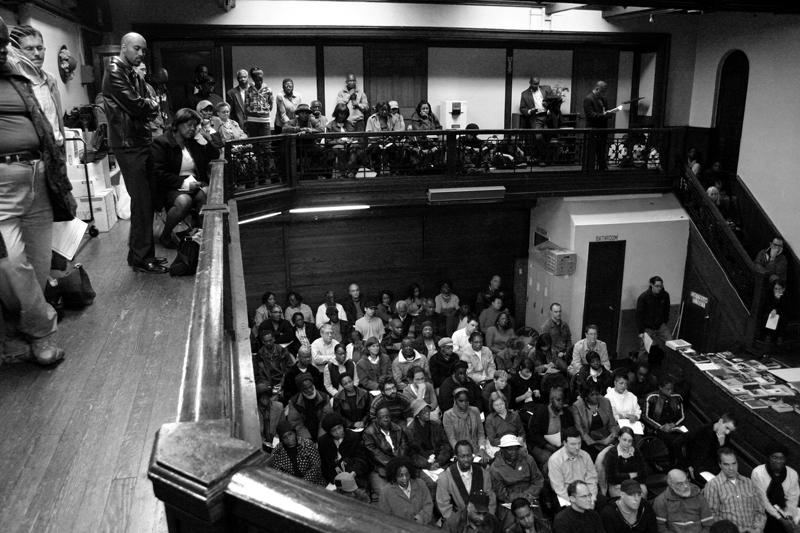 A standing-room-only audience heard about the glass tower’s inappropriate scale in relation to surroundings, its environmental impact (glass towers are often lethal to migrating birds), the visual intrusion of a skyscraper looming over Prospect Park, and the safety issues involved in high-rise construction. Presenters addressed the need for re-zoning to encourage contextual development. At the end of the evening, most of the estimated 140 audience members signed up for committee work. * The location of the building ‘on a commercial strip next to a transit hub’ is ideal for a large development. Clustering housing near subway stations and bus routes is environmentally beneficial; it decreases urban sprawl, makes maintaining transit infrastructure more efficient, and helps reduce auto traffic. * Opponents of the building claim that the addition of luxury apartments to PLG will increase rents and price out many long-time residents. But limiting housing and refusing to build for density has the same effect. Fewer homes means greater demand for them and higher prices. 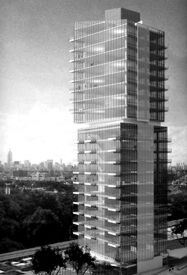 The Tower is located right next to the subway; apartments on lower floors will, by necessity, be lower cost. * The location, a prime commercial space, has sat dormant for at least a decade, a nightmare of asbestos, mold and vermin. Increased foot traffic will create a safer, more lively commercial block. * The builder has not asked for any exemptions from FAR or public subsidy. * The residential blocks of Lefferts Manor and larger PLG are separated by Flatbush Avenue. * The building is not actually going to be built on Ocean Avenue; it is set back a block from the street, reducing its visual impact. * The building is not unprecedented. Patio Gardens, located about a block away, is nearly as tall. And a number of tall buildings can be seen on all sides of the park. The ‘Concerned Residents’ claim that the tower will lead to higher rents and landlords harassing long-term tenants out of their apartments. The effect of the tower on rents is, at best, indirect and likely negligible; its effect on other landlords is irrelevant. For one thing, the building is likely to be mostly–if not entirely–condos. That means a possible net change of ZERO rental units. If the building is going to have any impact on the housing market it will be to slow the appreciation of value of properties for sale. Whereas there is currently a dearth of properties in move-in condition for sale in the neighborhood, there will suddenly be a burst of units available in various sizes. Rising rents are a problem for some in PLG, just as they are in every urban neighborhood in a period when people are flocking to cities. 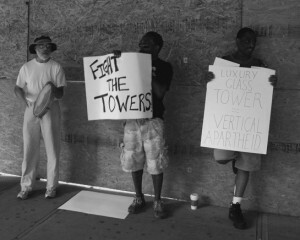 PLG will continue to see rising rents whether or not this tower goes up. Tenant advocacy–and preserving the existing rent stabilized and rent-controlled apartments in our neighborhood–is a much more fruitful avenue for addressing the problem than trying to stop a single building that will itself displace nobody. The real objective behind the formation of CRGPLG seems to be stopping a tall building from going up near Lefferts Manor. If that means shifting blame for the basic economics of supply and demand, exaggerated warnings about the coming avian holocaust, or stoking fears about gentrification, so be it. It may all be moot anyway. As the protest was going on, a back-hoe was busily moving about the site. It was probably getting the site ready for the foundation to be poured so that the developer can lock in the current zoning rules and make the next protest even more toothless.